It was the 100th anniversary of the formation of the Western Society of Naturalists this year. While WSN was originally a society with fairly broad interests in the terrestrial and marine realms, in the last few decades it has very much become focused on marine habitats, with the occasional estuarine or terrestrial presentations popping up. I try to make a point of going every year, since it’s a great way to catch up on marine science along the west coast of North America (and elsewhere on the globe), and it’s a very student-focused meeting, with at least half of the posters and talks being presented by graduate students or undergraduates, and even a few high school students. 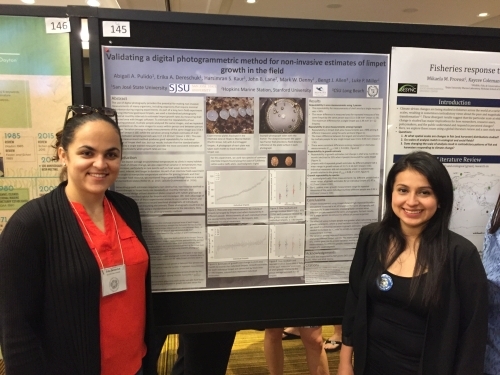 This year two of our SJSU undergraduate students presented their work evaluating how repeatable our protocol for measuring limpet sizes and growth via digital photographs taken in the field could be. A copy of the poster is linked here. Erika and Abigail stood by this poster for a heroic 2.5 hours, as did so many of the other poster presenters. It was a marathon session.